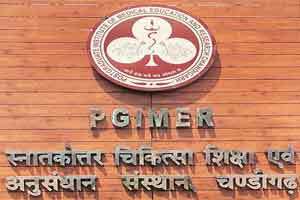 Chandigarh: The Post-Graduate Institute of Medical Education and Research (PGIMER) will start a Cancer Institute, a screening OPD and a learning resource centre at Sarangpur, around 2-km from the hospitals campus. The facilities will come up in over 50 acres of land, which was sanctioned to the PGIMER by the Chandigarh administration, the director of the institute, Jagat Ram, said at a press conference. The director said he had earlier written to all the head of departments (HoDs) to come up with suggestions about new facilities that can be started at Sarangpur. He said the reason behind having the screening OPDs in Sarangpur, was to cut down on the heavy rush of patients to the main PGIMER campus. “Close to 75 per cent of the faculty, including HoDs, said that the screening OPD and the trauma centre should be moved to Sarangpur,” Ram said. The patients will be screened at OPDs in the Sarangpur campus and those requiring to be treated in specialised clinics will be referred to the main institute, he said. However, Ram said OPDs of the Advanced Eye Centre and the paediatric and cardiac centres will not be moved to Sarangpur. He said the learning resource Centre will be set up for teaching purposes. “Residents, faculty and trainees, including those from regional medical colleges, can come to the resource centre,” Ram said. It will take around four years to complete the construction of these facilities, the director said. He also said centres like the Organ Transplant and Geriatric Centre would be constructed within the PGIMER campus. Deputy Director (Administration) Amitabh Avasthi said one of the most important factors would be providing connectivity between the main campus and the proposed one at Sarangpur. The engineering department as per the by-laws of UT administration will work on it, Avasthi said. Replying to a question, Ram said he has brought it to the notice of all HODs that the reports regarding non-availability of some doctors in the new OPD block at the stipulated time have come to the notice. He urged faculty members to work out a mechanism so that the OPD and teaching work can be carried out in a planned and proper manner.